It's that time of year again when you shower that special man in your life (your dad!) with presents and affection... just because you can! 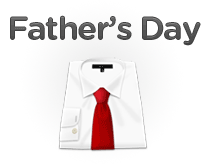 Oh and because your calendar says Father's Day too! Finding the perfect present for men can be tricky enough but your pops can be that much more difficult! I mean, can't you just give him a box of Werthers Originals or something?! But alas, we have clubbed together a load of our finest Father's Day promotional codes to not only buff your inspiration but also save you a few pounds and pence while you're there! It doesn't have to be super hard to show your dad how much he means to you, and it doesn't have to cost a gazillion pounds IF you know where to look! So check out the discount codes we have and go get your shop on!